Latest spy shots reveal the i3 EV’s eyes and brings its shape further into focus. 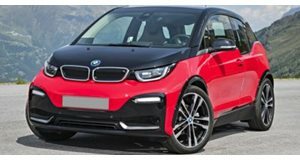 With the BMW i3 penciled in for production next year and a near-production model residing at BMW&apos;s London Park Lane showroom, it appears the automaker is prepared to let its prototype out with less camo. These latest spy shots reveal the four-door concept&apos;s front and rear lights, while its lines and shape have come further into focus via the removal of some fake panels. The i3 utilizes BMW&apos;s new Live and Drive architecture, the Drive component being made up of a 168-hp rear-mounted electric motor. BMW claim that the i3 will go from standstill to 40 mph in 4.0 seconds and onto 62 mph in 8 seconds. A six-hour charge will be enough for a 140-mile range. The i3 will join the i8 sportscar in a new line of electric vehicles from BMW as a dedicated sub-brand to parallel the M performance line, but with greener credentials.